It came as a shock to many people in Wakefield when they learned that Mr. William Bagnall had passed away on Tuesday at his residence, -Westmorland Avenue, BlackpooI. Mr. Bagnall, who was 54 years of age, was highly respected in many circles in Wakefield. He continued the business carried on by his father, as a builder and contractor at Eastmoor, but soon after the war he retired and went to live at Blackpool. 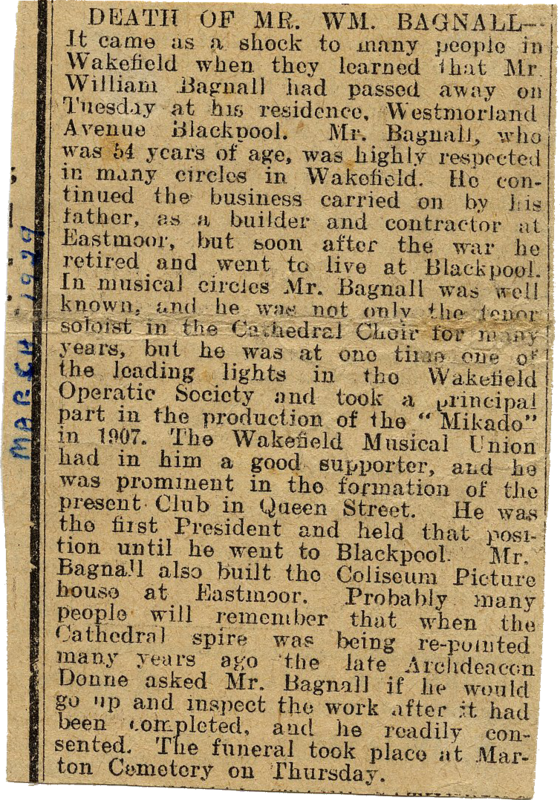 In musical circles Mr. Bagnall was well known and he was not only the tenor soloist in the Cathedral Choir for many years, but he was at one time one of the leading lights in the Wakefield Operatic Society and took a principal part in the production of the "Mikado" in 1907. The Wakefield Musical Union had in him a good supporter, and he was prominent in the formation of the present Club in Queen Street. He was the first president and held that position until he went to Blackpool. Mr. Bagnall also built the Coliseum Picture house at Eastmoor. Probably many people will remember that when the Cathedral spire was being re-pointed many years ago, the late Archdeacon Donne asked Mr. Bagnall if he would go up and inspect the work after it had been completed, and he readily consented. The funeral took place at Marton Cemetery on Thursday.